From Trinidad go 18 miles west on Highway 12 to property. There is an entrance on the east side of Weston and another several miles further west at the old entrance to the Golden Eagle Mine. Campfires allowed only in designated areas. Unless you're hunting don't be discharging the firearms or bows. Camping allowed outside designated areas only by hunters during hunting seasons. Keep all food and garbage in bear-resistant manners. Road closures are posted regularly to protect wildlife and prevent resource damage. Closed from December 1 to March 31, except for licensed big game hunters and 1 non-hunting companion. No fishing allowed on the South Fork of the Purgatoire from day after Labor Day to first day of Memorial Day weekend. 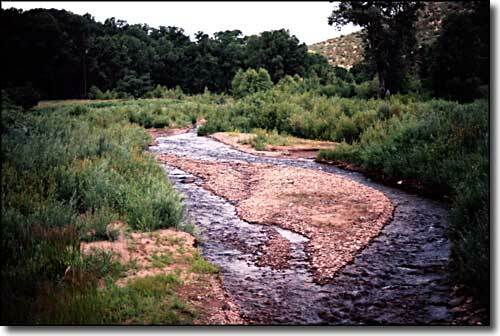 Artificial flies and lures only on South and Middle Forks of the Purgatoire River. All fish must be returned to the water immediately. 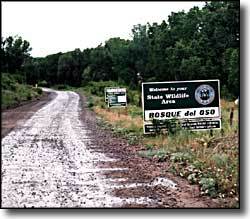 Bosque del Oso was previously owned by Basin Resources, a wholly owned subsidiary of Montana Power Corp., who retained the mineral rights after selling the surface rights to the Colorado Division of Wildlife. I say this because there is rumored to be a couple hundred coalbed methane wells on the property.